This weekend is something of a high holy day in many UU Churches. Martin Luther King, Jr. studied closely the writings of Unitarian Henry David Thoreau, and himself considered becoming Unitarian while at Boston College but chose not. He didn’t feel he could summon a cohesive momentum in our movement. But his example of action in the face of injustice is a frequent reference for us when we talk about doing justice as one of the primary pillars of a religious life. King was a central voice in the civil rights movement. He marched so that a vision of dignity could someday feel like a rightful expectation for people of color. And he did so knowing the painful reality of what it was to be black in an unenlightened America. Even after slavery was outlawed in the 1860s, people of color were still enslaved by fear. From 1882-1968 – when King was assassinated – 4,743 lynchings occurred in the United States. 3,446 were black men, women and children. Many of the whites were lynched for harboring or helping blacks escape… or for being anti lynching in general. So much changed in the world from the ideals he gave voice to. And yet, Trayvon Martin, Fruitvale Station and radical redistricting in North Carolina reminds us that the work continues. Ours to carry on. Martin Luther King Jr. only helped us get to the mountaintop. We still have a ways to go to reach the promised land. ‘Strange Fruit,’ the subject of today’s service is a phrase well known in the black community. It was a book made into a play and an opera by Lillian Daniel. It is the subject of hundreds of paintings. But all those works were inspired by a song – one we will hear in moment by Noelle Stanley. The song was inspired by a poem. And that poem was inspired by a picture. The picture is famous. So famous, it became a postcard which, when it appeared in town, terrorized people of color everywhere. It is a very disturbing picture. 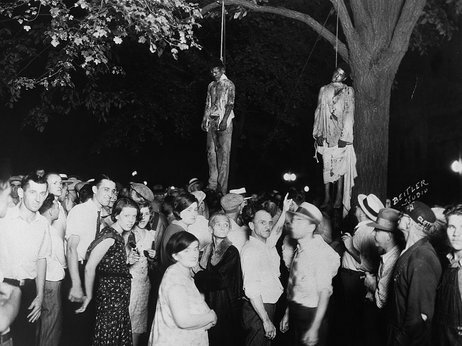 It shows the public hanging of two young black men. But one of the most notable – and disturbing – parts of the picture are the expressions of the people watching. I’m going to show the picture for a few seconds. You may find it too painful or difficult to look at. But clearly the people in the picture did not. I will show it for the next few seconds if you want to look away. This is not about blame. And it is not about guilt. It is simply to recognize what IS and what has been in America. And the different perceptions of that reality that come from looking at it from different points of view. a soft plea for MERCY. for one great collective cause. whenever inherent worth is put on trial. if we’ve come too far to turn it around? our collective sense of security. unleashed on an unsuspecting crowd. Martin Richard – an eight year old boy was killed. and Krystle Campbell – a young restaurant worker. were foreign born and ferociously armed. to be put back in place. of the weak and the vulnerable? in the Marion, Indiana town square. where the boys were being held. When they set them down. demanding that justice be done. And everyone knew what that meant. for their soft hearts to find rest. in the garden of an angry and vengeful God. since our lease in the garden was revoked. of rebuilding paradise into the promised land. that live in our imagination. which explains the shuffling of the crowd. ‘Cameron!’ called one low voice. ‘We want Cameron! We want Cameron! as he turned to the mob leader. ‘Go on. Get the hell out of here. In the dry hard pan of apathy and anger. already holding his two friends. searching for any sign of mercy. “… and they put it around my neck. because Cameron did not die that day. the rabid crowd from its prey. and called out for the people to stop. away from the moral cliff. from being strangled by blind vengeance. and make the garden untenable for creation. still struggling in our soul. Abel Meeropol was a teacher and a poet. were hung from the tree. and is blind to mercy. Meeropol mused as he saw the photo. where he expected looks of horror. stand at the center of almost every garden. was born outside the garden. some preachers use to describe the slaying. that burns in our conscience. to call back the spider. the news described a standoff. The shootout lasted for hours. as he raced from the scene of the crime. a little less wrapped in fear. that treated the 260 people injured in the explosions. said a police officer who helped find the suspect. of whether to pursue the death penalty. when you aren’t given a chance. where he went to hear her sing. of the prison sentence she served every day. in the center of her soul. during the red scare of McCarthyism. to build the world’s first atomic weapon. The two boys were lost in the madness. For a brief spell, they were even sent to a shelter. were too afraid to do so. of timid and tender conviction. It always came at the very end of her set. singing about the work of the devil. would suspend service so the room was quiet. which went dark at the song’s end. There were no curtain calls. As are Thomas Shipp and Abram Smith. As are Ethyl and Julius Rosenburg. which some will argue is a good thing. we are all descendants of Cain. after the violence in Boston. when they hear the angels song. Minds change all the time. and change the course of history. into its leanings toward good. ‘the song of the century’? there is trouble in the air. on cell phones are rather sophisticated. standing on the hood of Her car. I think this is what she might have sung. Singing, Mercy! What will become of us? Have we come too far to turn it around? and all try to give of what we need?